Recipe: Eton mess cheesecake – Snug Hug & Co. Grease a loose-bottomed 23cm/9in round cake tin and line with baking paper. For the base, put the crushed biscuits into a bowl with the melted butter and mix together. The mixture should resemble wet sand. Pour into the cake tin and pack tightly using the back of a spoon, then cover and place in the fridge for 15 minutes. Pour the cream into a large bowl, add the icing sugar and vanilla and whisk into soft peaks. Put the cream cheese into another bowl and stir to slacken. Add the cream mixture and the freeze-dried strawberry pieces to the cream cheese and fold together gently. Spoon on to the chilled base and level off. Put the cheesecake back into the fridge. For the strawberry sauce, put the strawberries, icing sugar and lemon juice into a food processor and pulse to a purée. Transfer to a bowl and put in the fridge. To make the mini meringues, preheat the oven to 120C/100C Fan/Gas ½. Line a baking tray with baking paper. Fit a piping bag with a 1½cm/½in star-tip nozzle and turn inside out. Stand it in a tall glass or jug until you need it. Put the egg whites into a large clean, glass bowl and whisk with an electric whisk or stand mixer. After 2 minutes the mixture should be frothy and increased in volume. Start adding the sugar a little at a time. Once all the sugar is added, keep whisking until you have stiff peaks. Using a brush and red food colouring, paint the inside of the piping bag with red stripes, starting with the tip and painting only as far as you will fill the bag. Fill the bag with the meringue mixture and pipe little kisses on to the tray. Bake the meringues for 1 hour. Turn off the oven and leave the door open, and leave the meringues in the oven for another hour. Remove them from the oven and take them off the paper. For the white chocolate-dipped strawberries, gently melt the chocolate in a bowl over a pan of simmering water (do not let the bowl touch the water.) Using the same tray you made the meringues on, flip the paper over. Hold the strawberries by the stalk and dip them into the white chocolate to come three-quarters of the way up. Place on the tray to set – you can put them into the fridge to speed up the setting. Take the cheesecake out of the fridge, remove from the tin and place on a serving board. Just before serving, pour over enough sauce to just cover the top – you may not need it all. Top with the dipped strawberries, meringues and lustred dehydrated strawberry slices. 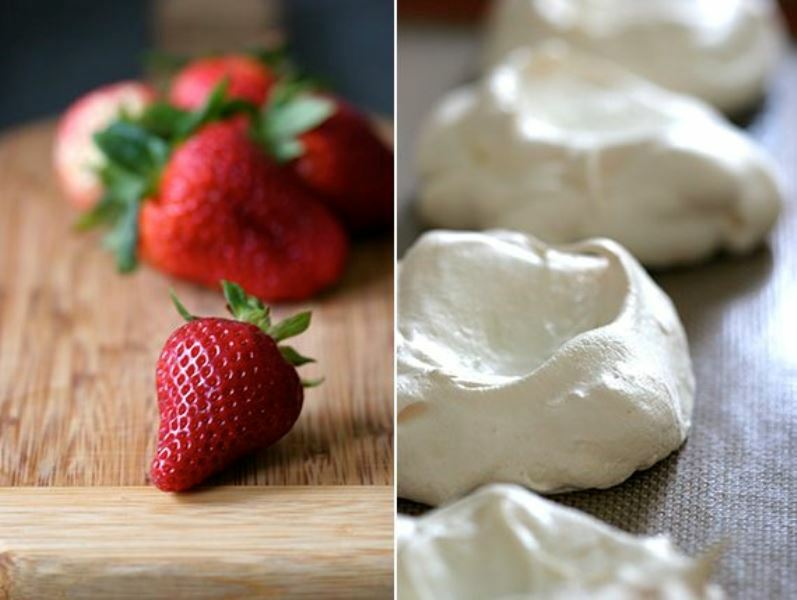 Strawberries and meringue is alwas an amazing combination! Well, what do you think? Let us know! 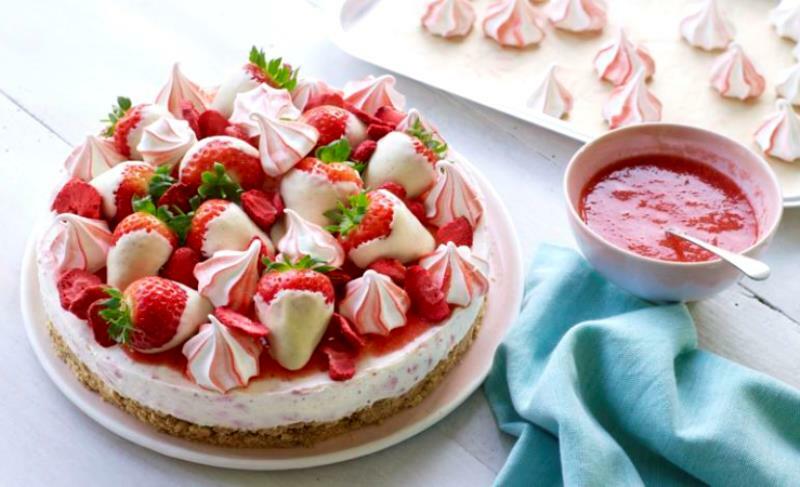 This entry was posted in Inspiration and tagged cheesecake, meringue, recipe, strawberries, summer.